MARGINS Central America Focus Site activity map showing instrument and profile line locations. Sources: ODP sites - Morris et al., MARGINS Newsletter 10, Spring 2003. Fluid flow meters - Deshon et al. 2003, Brown,The Seismogenic Zone Revisited, Snowbird, Utah 6-21 March, 2003, and Tryon, pers. com. 2005. 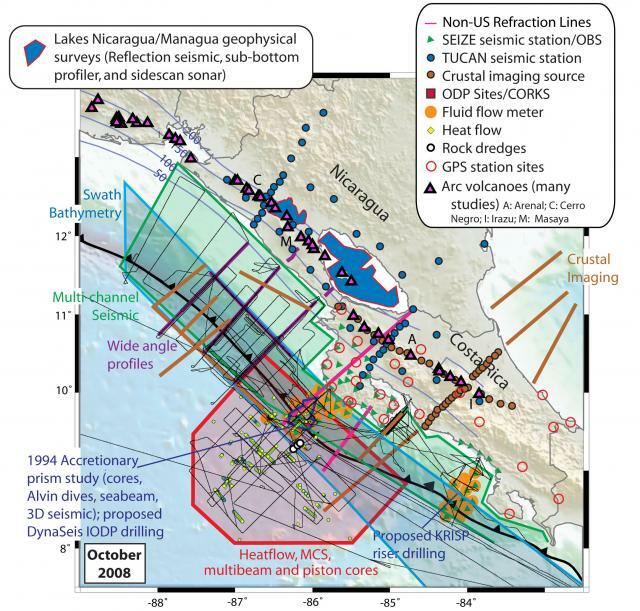 SEIZE seismic stations and OBSs-Syracuse et al., 2008,& and DeShon et al., 2003.TUCAN seismic stations- TUCAN website. Heat flow - Fisher et al., 2003 and Hutnak et al., 2006, GJI including MARGINS and non-MARGINS data. Swath bathymetry and wide angle profiles - McIntosh et al., MARGINS Newsletter 8, Spring 2002. Multichannel seismic (MCS) - McAdoo et al., Geophys. Res. Lett., 1996 and McIntosh et al., 2002, as before. 1994 Accretionary Prism Study - McAdoo et al., 1996, as before. Slab depth contours - Syracuse and Abers, 2006. Crustal Imaging - Holbrook, pers. comm. High-res seismic (lakes of Nicaragua, Oct. 05) - McIntosh, pers. comm. Shiptracks (multibeam, gravity magne,tics, etc.) - DANA01RR, EW9502, EW0005 and EW0104 plotted from MGDS metadata (Cruise VANC02MV to be added once shiptrack is available). Rock dredge sites - DANA01RR from MGDS metadata. Crustal imaging (Holbrook et al.) from Langseth 2008 cruises (MARGINS Data Portal). Non-US refraction lines - DeShon pers.com. Lakes Nicaragua/Managua geophysical - McIntosh pers.comm. GPS station sites - Norabuena et al., JGR, 2004. Swath bathymetry from Weinrebe & Ranero, in GeoMapApp and MARGINS Data Portal.